Military, Political and Social History Stock Footage. Rare newsreels and propaganda films documenting 20th century leaders, empires, wars and upheavals. Specializing in Third Reich, Soviet and Vietnam War eras. US Government propaganda films, Aviation, U.S. and Soviet space exploration, Naval history, Cold War. Including 15,000 historic photos. Footage available on all video formats and TV Standards. Phone, fax or E-mail for specific inquires. 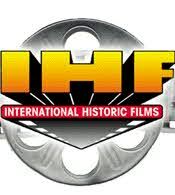 STANDARD DVD DEMO (Window dubs): IHF maintains a ready standing inventory of DVD visual time-coded (window dubs) recordings of Newsreel and popular stock footage motion pictures. Standard DVD demo window dubs are usually shipped within 24 hours. The cost per single window dub DVD is $25.00. The window dub DVD does not have to be returned, and is yours to keep. CUSTOM RECORDED DVD DEMO (Window dubs): Material specially researched and compiled upon a DVD with visual time code are available. The cost for custom recorded DVD demo window dubs varies according to the amount of research time and material. Call or fax to receive a quotation. USAGE FEES: IHF stock footage usage fees vary depending on the specific use of the footage (see rate card for fees). Usage fees and duplication / lab costs are billed upon initial order of Master element(s). Any additional costs will be due upon delivery of the Master element(s) to the client. If necessary, final billing will be made upon IHF's review of the finished project and will only be due if the project has exceeded the usage amounts that have been paid for. ORDERING MASTER ELEMENT(S): After viewing the Demo window dub DVD(s), phone or fax IHF with the exact in and out time codes and a brief description of each shot. Upon receipt of this information, we will locate the appropriate master element(s) and provide you with cost and scheduling information. REFUNDS: All sales are final and non-refundable. The client must pay the usage fee, duplication/lab and shipping costs for all material ordered whether or not it is used in the final production. ELEMENTS: All elements (final compilation of video material) are owned by IHF and must be returned upon the completion of the project. *Orders containing more than 4 cuts will require an additional $15.00 per cut. All footage is licensed by the second with a minimum of 10 seconds per shot. Prices maybe negotiable on volume orders.